There are two schools of thought on the “industrialization” of single-use bioprocessing. The camps cannot agree if disposable processing has fully arrived or not. A panel discussion at IBC’s recently completed “Bioprocess International Conference & Exhibition” in Long Beach, CA, sought to resolve this issue once and for all. A minority view held that disposable processing will not have fully arrived or been industrialized until single-use equipment becomes widely available for end-to-end unit operations industry-wide and across production scales. Defining industrialization solely in terms of end-to-end disposability also neglects the evolution of bioprocessing itself. Scale notwithstanding, end-users employ disposables when it makes economic sense. “They’re already doing it wherever possible, which sometimes is every process step,” Sellick explained. An industry study cited by Justin Hutchinson, associate director of product management for Thermo Fisher Scientific’s cell culture and bioprocessing business, estimates that more than 40% of integrated single-use systems are now used in GMP manufacturing. Working volumes for integrated single-use bioprocess containers, systems, and support equipment have steadily risen from sub-1,000-L levels (50–500 L) to the 2,000 L range, with prototypes exceeding 5,000 L for some applications. At first the upper limits were defined by engineering limitations such as mixing, manufacturability, disposal, and supporting the massive weights of very large bags. Most of those concerns have been addressed, particularly with mixing. Now many experts agree that single-use equipment will eventually dominate bioprocessing up to around the 2,500–3,000 liter scale; above that, companies will begin to implement continuous processing, which is still in its very earliest stages for pharmaceuticals and biopharmaceuticals, or closer-term by running several batches side-by-side. Besides, the issue of size is fading for disposable bioreactors. “When people say monoclonal antibody, they automatically think very large-scale, multiple 10,000 liter bioreactors,” said Sellick. Yet this is a fallacy, as few new 10 kL mAb processes are in the works. Sellick admited, however, that large-scale chromatography has been difficult to achieve in disposable format at levels that are economical. The culprit is primarily the cost of resins, particularly for the capture step in monoclonal antibody production. Developers point to work-arounds to protein A such as resins bearing synthetic IgG binding ligands or recombinant protein A binding domains, mixed mode, and cationic exchange as technologies that might tip the scale of economy in favor of single-use or, at least, single-campaign usage. That being said, the impact of scale on single-use chromatography economics is a fact of life. Several large biotech companies employ fully disposable processing, including chromatography, for smaller, mid-titer, clinical trial manufacturing processes, and companies like Repligen have made a nice business of single-use chromatography at very small scale. Alternative capture technologies are exciting but their uptake will be slow since cost would need to fall by at least a factor of five before they become slam-dunk single-use decisions. So it should come as no surprise that processors and vendors are sticking to more familiar separation modalities. Fred Mann, Ph.D., program manager for biopharm process solutions at EMD Millipore, said that industrialization of single use is ongoing, with most unit operations already available in disposable format and several vendors offering prepacked chromatography columns. The question is whether the various components can be assembled “as a package.” Toward this end, top vendors have been working, along with biopharmaceutical clients, on integration strategies. Many end-users that EMD Millipore works with are small and lack the process expertise required to scale up single-use manufacturing. “We can do a lot of the work of designing the process and scaling up from bench scale, and thereby save them time and effort,” said Dr. Mann. EMD Millipore is also developing a set of scale-down tools and protocols to help its customers with single-use process development. Standardization should allow customers to mix and match equipment from different vendors through universal connectors. Yet, often the materials of construction will differ between bags of different sizes, even when the materials are nominally identical. At least one major biopharmaceutical company has noted effects on cell growth due to materials (or methods) of construction. But Will It Play in GMP Land? Attridge believes that end-to-end disposable processing is already here, including for separations. Today’s smaller batches, higher titers, and higher capacity resins are well suited to the use of single-campaign resins and columns. GE Healthcare’s ÄKTA™ ready chromatography systems and ReadyToProcess columns, which were introduced several years ago, are designed for such applications. 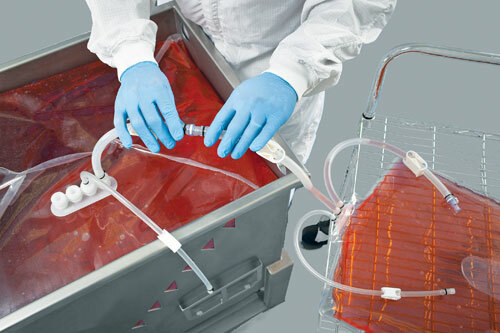 A significant component of industrialization is standardization, which GE Healthcare has addressed with standardized, off-the-shelf assemblies for cell culture harvest and tangential flow filtration, disposable, aseptic, genderless, universal connectors, and nonproprietary films and materials of construction for its bags, connectors, and tubing. Attridge believes that controls and sensors will become significant concerns in the industrialization of single-use bioprocessing. While supervisory and control systems are usually proprietary, their ability to communicate through industry-standard OPC clients will further drive industrialization. In September 2011, GE Healthcare and Sartorius Stedim Biotech signed an agreement by which GE will sublicense patents held by the University of Maryland and spinoff Fluorometrix, to which Sartorius Stedim Biotech had enjoyed exclusive commercialization rights. This intellectual property covers bioreactors with at least two optical sensors for process monitoring. Similarly, GE Healthcare granted Sartorius Stedim Biotech sublicensing rights that it had with SciLog, which specializes in disposable sensors for bioprocessing. One cannot mention GMPs without discussing validation as well, particularly for new technologies “There is less need today for validation or testing on the customer’s end for single-use products,” Hutchinson said. Increasingly, top-tier manufacturers are creating redundant, worldwide supply chains and facilities to maintain consistent, reliable supply for critical customer and partner processes. Bill Hartzel, product manager for medication delivery solutions at Catalent Pharma Solutions noted that the progression of single-use bioprocessing, at least for CMOs, has been based on risk management and risk progression. “Single-use technologies are now beginning to take hold downstream.” Hartzel noted that “some issues” remain with purification, and that faster, higher-titer upstream processing will continue to create downstream bottlenecks. From the end-user side that means larger scales and GMP adoption beyond pilot and clinical scales, which forces suppliers to employ more mature technologies, more automation, and greater standardization of unit operations. Vendors face a great demand to evolve single-use along these lines, Priebe said, and to create the proper balance of flexibility and “platforming,” while maintaining a strong supply chain and recognizing the uniqueness of every process. But suppliers must also provide configurable or unique systems at the same quality level as standardized products, which requires extra effort from vendors. “It’s easy to tell customers ‘it’s just a bag, put it together.’” Assemblies consisting of 20 bags, tubing, and connectors, however, must be prototyped for usage and packaging. “It becomes an R&D or engineer-to-order project,” Priebe explained. If judged by uptake, then single use is already fully industrialized. “The percentage of companies employing disposables is very, very high,” Craig said. “There are already some approved products using disposables, and many in clinical stage.” Furthermore, he noted that limiting the term “industrialization” to processes that employ disposables end-to-end is a mistake. Some unit operations are perfectly suited, he said, while others are not. 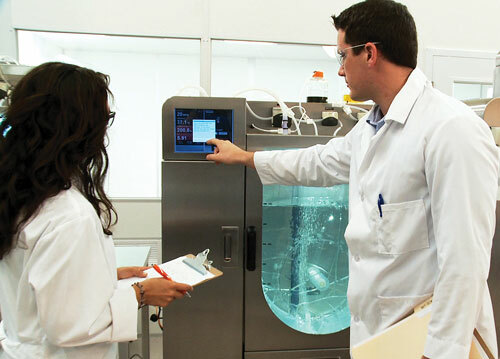 Over the last five years Thermo Fisher Scientific, has filled out its single-use BioProcess Container (BPC) bioreactor and mixer product lines to cover volumes from benchtop to 2,000 L. Its experience in expanding its product line is reminiscent of how disposable processing itself came into being. In the early days, HyClone, which Thermo Fisher acquired to enter the disposable bioprocessing business, shipped its preformulated media and buffers in flexible plastic containers. According to Hutchinson, “Customers began thinking that they might use these BPCs in similar fashion to the containers we were using to ship media and process liquids for collecting downstream process fluids.” Before long customers were commercially using “dry” BPCs for media storage and transport, and, finally, for cell culture. Integration of single-use equipment has become a buzzword, but one that is quite useful for understanding evolving customer needs and how vendors can satisfy them. Thermo Fisher’s systems integration initiatives are part of a more general trend toward greater functionality in single-use bags, particularly with respect to controls, automation, and single-use sensors. The industry is asking for these sensors to monitor and control parameters such as carbon dioxide levels, conductivity, temperature, and pressure as well as more common pH and dissolved oxygen. Integrity™ 2-D BPVs, made with ATMI’s universal Integrity TK8 film, are compatible with ATMI’s single-use mixing and bioreactor technologies and are designed to form a sterile connection between two single-use bioprocess bags. Mixing has been problematic for the single-use equipment industry. If a bioreactor or mixing vessel is to be truly disposable and sterile at all points of use, then that must include everything inside the bag. Disposable bioreactor manufacturers must watch for shear stress on cells while avoiding mechanisms that rub against plastic fluid contact surfaces and possibly release polymer shards or leachable chemicals. PBS Biotech (www.pbsbiotech.com) employs U-shaped bioreactors that incorporate an Air-Wheel™, which spins and agitates cell cultures through the buoyancy of rising gas bubbles. As bubbles percolate through the culture they turn the Air-Wheel and avoid the need for external actuation. According to the company this results in rapid, homogeneous mixing and a high mass transfer rate with extremely low shear stress on cells. “Gas is required for all bioreactors, so our bioreactor kills two birds with one stone,” said Brian Lee, Ph.D., co-founder and CEO. PBS offers scalability from three liters for lab work, and 80 liters for preclinical and clinical batches. In targeting full-scale GMP production, the company plans to produce a 500 L system later this year, and a 2,500 L bioreactor in 2012. These volumes, which are fairly common these days, speak to where biomanufacturing is heading in the coming years. PBS Biotech uses U-shaped bioreactors, which incorporate an Air-Wheel that spins and agitates cell cultures through the buoyancy of rising gas bubbles.